Onboard Diagnostics Version 2 (OBD-II) is in all passenger vehicles in the world - manufactured after a certain date. Designed to detect failures in various parts of vehicles systems. In which case the "CHECK ENGINE" light will turn-on to warn the driver. Furthermore — OBD will store a Diagnostic Trouble Code (DTC) which identifies what/where/when the failure occurred. Good news is — a diagnostic tool can be used to retrieve these DTC codes. Hence making it easy for home owners or car mechanics to find and fix the problem. Alerts the vehicle operator if the vehicle's emissions output rises in response to a system failure. Performs real-time analysis of the engine's performance to help manufacturers achieve regulated vehicle fuel economy. Standardizes the electrical and communications protocols for the automotive industry. OBD-II has allowed vehicle manufacturers to stay within the Environmental Protection Agency's (EPA) emissions guidelines, and made it easier to diagnose problems in a wide variety of vehicles using only one tool. OBD is more or less a sophisticated data-acquisition system for vehicle emissions and performance. What is the History Behind OBD-II? In 1955 the government took notice of the detrimental effects that car emissions were having on the atmosphere. Early laws were passed that gave vehicle manufacturers strict guidelines to follow with regard to vehicle emissions. These laws were generally ignored until 1988 when the Society of Automotive Engineers (SAE) proposed several standards, and the Air Resources Board (ARB) mandated them on all 1988 and later vehicles. These mandates were, in effect, OBD-I. The original OBD was a simple system that monitored the oxygen sensors, exhaust gas recirculation (EGR) system, fuel delivery system, and the engine control module (ECM) for excessive emissions. Unfortunately, different car manufacturers complied with the ARB's mandates in different ways. In fact, compliance was so varied that a new problem developed. The problem was that manufacturers had equipped their vehicles with OBD systems that weren't standardized. Consequently, each manufacturer had its own set of fault codes and its own tools to interpret the codes. Independent repair facilities across the country were struggling to diagnose vehicles with such a wide variance in both fault codes and in the equipment necessary to interpret them. The EPA stepped in and created an extensive list of procedures and standards based on the findings of the SAE and ARB. This list resulted in the second generation of onboard diagnostics, OBD-II. By 1994 manufacturers were to implement OBD-II unless a waiver was granted. Almost every manufacturer applied for, and received, a waiver. However, in 1996 all new passenger vehicles were required to be equipped with OBD-II—without exception. Vehicle requirements for OBD-II are light trucks or passenger vehicles, manufactured for sale in the U.S. after January 1st, 1996. California requires OBD-II compliance for all gasoline (MY 1996+) and diesel (MY 1997+) vehicles up to 14,000 lbs (6,350kg). The National LEV program requires compliance for all vehicles that weigh 6,000 lbs (2721kg) or less. If the vehicle is not required to be OBD-II compliant, it will utilize an OBD-I system. OBD-I is used on all Ford vehicles over 8,500 lbs (3,855kg). The idea behind OBD-II is simple: in vehicles manufactured in 1996 or later, no matter who the manufacturer is, there is a standard set of fault codes that use a standard tool to interpret them. As the years went on, some manufacturers improved upon their implementation of OBD-II. In addition to the basic standard, they implemented optional support (i.e., more sensors). Some manufacturers (Ford, GM, etc.) didn't stop with optional support, but saw the utility in going above and beyond. These enhanced implementations give access to more sensors and even more descriptive fault codes. Although they are vehicle specific, their value can be easily seen by any service shop that specializes in that make, or a tuner that wants to wring every ounce of performance from his vehicle. The newest addition to the OBD-II specification is an electrical interface called CAN. CAN is short for Controller Area Network. All vehicles will standardize on the CAN electrical interface starting in the model year 2008. Some manufacturers have already begun the transition (Ford, GM, Jaguar, Nissan, Mazda, Mercedes, and Toyota to name a few.). With the success of OBD-II, European countries adopted EOBD. All petrol cars sold within Europe since January 1st, 2001, and diesel cars manufactured from 2004 onwards — must have onboard diagnostic systems to monitor engine emissions. Some manufacturers (Ford and GM) who sold into the European market already had OBD interfaces prior to this requirement. EOBD is the European equivalent of the OBD-II standard. The Environmental Protection Agency has been charged with reducing "mobile emissions" from cars and trucks and given the power to require manufacturers to build cars which meet increasingly stiff emissions standards. The manufacturers must further maintain the emission standards of the cars for the useful life of the vehicle. OBD-II provides a universal inspection and diagnosis method to be sure the car is performing to OEM standards. While there is argument as to the exact standards and methodology employed, the fact is there is a need to reduce vehicle emitted pollution levels in our cities, and we have to live with these requirements. Pre-OBD-II cars had connectors in various positions under the dashboard and under the hood. All OBD-II cars have a connector located in the passenger compartment easily accessible from the driver's seat. Check under the dash or behind or near the ashtray. A cable is plugged into the OBD-II J1962 connector and connected to TOAD or another scan tool. TOAD is available in PC/laptop. Other scantools on the market range from simple hand-held meters that display trouble codes, up to a large console computer-based unit costing thousands of dollars. Scanners vary greatly in their complexity. The best connect easily and use software to quickly and automatically call up the OBD-II information. A system connecting to a laptop or desktop computer provides expanded memory for data and a graphing utility. Though not part of the EPA's OBD II standard, the diagnostic read-outs used by dealership technicians are also read through the OBD II connector. These service codes show you such things as knock sensor operation, FI pulse width, ignition voltage, individual cylinder misfires, transmission shift points and ABS brake condition. There can be over 300 readings available, depending on the vehicle manufacturer and model. Vehicles vary in the readings they will support. Scanners vary widely in the number of these signals that they can read. Some show just the basic OBD or OBD II signals, others show the full range of service codes. Is Your Car OBD-1 or OBD-2? What Does the OBD-2 Plug Look Like? * Be careful, as many vehicles that do not comply with the OBDII standards do occasionally use the J1962 type connector for data, but do not use an OBDII protocol, pre-01 VW/Audi's are a classic example. These may appear as if they should work, but they will not. What are the Different OBD2 Protocols? 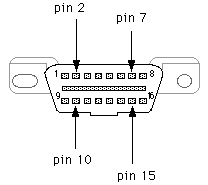 All of these use the same connectors and can be read by a standard OBDII scanner.